This is a list of plains on Mars. Such features are named after the nearest classical albedo feature in compliance with the International Astronomical Union's rules of planetary nomenclature. Plains may be named denoted "planitia" or "planum", depending on height. Planitia (plural: planitiae) is Latin for plain. It is the IAU descriptor term for features which are "low plains". Planum (plural: plana) is the Latin word for plateau. It is the IAU descriptor term for plateaus and high plains. This article was based on the USGS's Gazetteer of Planetary Nomenclature. Wikimedia Commons has media related to Plains on Mars. Hellas Planitia is a plain located within the huge, roughly circular impact basin Hellas located in the southern hemisphere of the planet Mars. Hellas is the third or fourth largest impact crater and the largest visible impact crater known in the Solar System. The basin floor is about 7,152 m deep,3,000 m deeper than the Moons South Pole-Aitken basin and it is centered at 42. 4°S70. 5°E / -42.4,70.5. Hellas Planitia is in the Hellas quadrangle and the Noachis quadrangle, with a diameter of about 2,300 km, it is the largest unambiguous impact structure on the planet, the obscured Utopia Planitia is slightly larger. Hellas Planitia is thought to have formed during the Late Heavy Bombardment period of the Solar System, approximately 4.1 to 3.8 billion years ago. The altitude difference between the rim and the bottom is 9,000 m, the depth of the crater explains the atmospheric pressure at the bottom,12.4 mbar during the northern summer. It has been theorized that a combination of action and explosive boiling may be responsible for gully features in the crater. Argyre Planitia is a plain located within the impact basin Argyre in the southern highlands of Mars. Its name comes from a map produced by Giovanni Schiaparelli in 1877, it refers to Argyre, a mythical island of silver in Greek mythology. Argyre is centered at 49. 7°S316. 0°E / -49.7,316.0, the basin is approximately 1,800 km wide and drops 5.2 km below the surrounding plains, it is the second deepest impact basin on Mars after Hellas. The crater Galle, located on the east rim of Argyre at 51°S 31°W, Argyre is surrounded by rugged massifs which form concentric and radial patterns around the basin. Several mountain ranges are present, including Charitum and Nereidum Montes, four large Noachian epoch channels lie radial to the basin. Three of these channels flowed into Argyre from the south and east through the rim mountains, the fourth, Uzboi Vallis, appears to have flowed out from the basins north rim to the Chryse region and may have drained a lake of melting ice within the basin. A smaller outflow channel named Nia Valles is relatively fresh-looking, and probably formed during the early Amazonian after the major fluvial, the original basin floor is buried with friable, partially deflated layered material that may be lake sediment. Syrtis Major Planum is a dark spot located in the boundary between the northern lowlands and southern highlands of Mars just west of the impact basin Isidis in the Syrtis Major quadrangle. It was discovered, on the basis of data from Mars Global Surveyor, to be a shield volcano, but was formerly believed to be a plain. The dark color comes from the volcanic rock of the region. A possible landing site for the Mars 2020 rover mission is Jezero crater within the region, the northeastern region of Syrtis Major Planum is considered a potential landing site. Syrtis Major is centered near at 8. 4°N69. 5°E /8.4,69.5, extends some 1,500 km north from the planets equator and it is in the Syrtis Major quadrangle. It encompasses a large slope from its edge at Aeria dropping 4 km to its eastern edge at Isidis Planitia. 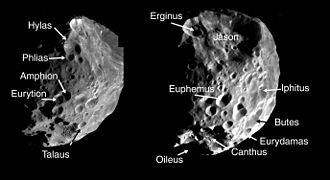 It includes a high-altitude bulge that rises 6 km at 310° W, most of Syrtis Major has slopes of less than 1°, a much lower inclination than the slopes of the Tharsis shield volcanoes. It has a 350 by 150 km north-south elongated central depression containing the calderas Nili Patera and Meroe Patera, the floors of the calderas are not elevated relative to the terrain surrounding Syrtis Major. The floor of Nili Patera is the less cratered, and therefore the younger, while most of the rock is basaltic, dacite has been detected in Nili Patera. Crater counts date Syrtis Major to the early Hesperian epoch, it postdates formation of the adjacent Isidis impact basin, the name Syrtis Major is derived from the classical Roman name Syrtis maior for the Gulf of Sidra on the coast of Libya. Syrtis Major was the first documented surface feature of another planet and it was discovered by Christiaan Huygens, who included it in a drawing of Mars in 1659. He used repeated observations of the feature to estimate the length of day on Mars, the feature was originally known as the Hourglass Sea but has been given different names by different cartographers. In 1840, Johann Heinrich von Mädler compiled a map of Mars from his observations, in Richard Proctors 1867 map it is called Kaiser Sea. Camille Flammarion called it the Mer du Sablier when he revised Proctors nomenclature in 1876, the name Syrtis Major was chosen by Giovanni Schiaparelli when he created a map based on observations made during Mars close approach to Earth in 1877. It is located at the antipode of Argyre Planitia, centered at 46. 7°N117. 5°E /46.7,117.5. It is in the Casius quadrangle, Amenthes quadrangle, and the Cebrenia quadrangle of Mars, many rocks at Utopia Planitia appear perched, as if wind removed much of the soil at their bases. A hard surface crust is formed by solutions of minerals moving up through soil, some areas of the surface exhibit what is called scalloped topography, a surface that seems to have been carved out by an ice cream scoop. This surface is thought to have formed by the degradation of an ice-rich permafrost, on November 22,2016, NASA reported finding a large amount of underground ice in the Utopia Planitia region of Mars. 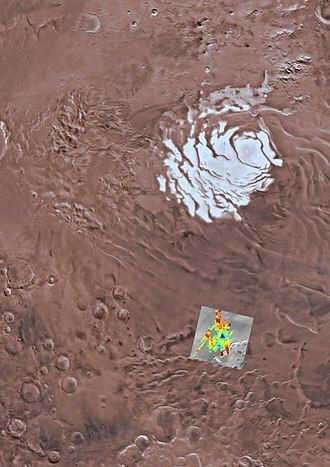 The volume of water detected has been estimated to be equivalent to the volume of water in Lake Superior, scalloped topography is common in the mid-latitudes of Mars, between 45° and 60° north and south. It is particularly prominent in the region of Utopia Planitia in the hemisphere and in the region of Peneus. Such topography consists of shallow, rimless depressions with scalloped edges, scalloped depressions can be isolated or clustered and sometimes seem to coalesce. A typical scalloped depression displays a gentle equator-facing slope and a steeper pole-facing scarp and this topographic asymmetry is probably due to differences in insolation. Scalloped depressions are believed to form from the removal of material, possibly interstitial ice. This process may still be happening at present, patterned ground is quite common in some regions of Mars. It is commonly believed to be caused by the sublimation of ice from the ground, sublimation is the direct change of solid ice to a gas. This is similar to what happens to dry ice on the Earth, places on Mars that display polygonal ground may indicate where future colonists can find water ice. Patterned ground forms in a layer, called latitude dependent mantle. In the Star Trek media franchise, Utopia Planitia—both on Marss surface, the USS Enterprise-D, USS Defiant, USS Voyager, USS Sao Paulo were built there. The Lunae Palus quadrangle is one of a series of 30 quadrangle maps of Mars used by the United States Geological Survey Astrogeology Research Program. The quadrangle is referred to as MC-10, Lunae Planum and parts of Xanthe Terra and Chryse Planitia are found in the Lunae Palus quadrangle. The Lunae Palus quadrangle contains many ancient river valleys, the quadrangle covers the area from 45° to 90° west longitude and 0° to 30° north latitude on Mars. The Viking I Lander landed in the quadrangle on July 20,1976, at 22. 4°N47. 5°W /22.4 and it was the first robot spacecraft to successfully land on the Red Planet. The sky would be a light pink, the dirt would appear pink. Rocks of many sizes would be spread about, one large rock, named Big Joe, is as big as a banquet table. Some boulders would show erosion due to the wind, there would be many small sand dunes that are still active. The wind speed would typically be 7 meters per second, there would be a hard crust on the top of the soil similar to a deposit, called caliche which is common in the U. S.
Southwest. Such crusts are formed by solutions of minerals moving up through soil, the soil resembled those produced from the weathering of basaltic lavas. The tested soil contained abundant silicon and iron, along with significant amounts of magnesium, sulfur, trace elements and yttrium, were detected. The amount of potassium was five lower than the average for the Earths crust. Some chemicals in the soil contained sulfur and chlorine that were like those remaining after the evaporation of sea water, sulfur was more concentrated in the crust on top of the soil than in the bulk soil beneath. The sulfur may be present as sulfates of sodium, calcium, a sulfide of iron is possible. Both the Spirit Rover and the Opportunity rover found sulfates on Mars, the Opportunity rover found magnesium sulfate and calcium sulfate at Meridiani Planum. These minerals are typical weathering products of mafic igneous rocks, studies with magnets aboard the landers indicated that the soil is between 3 and 7 percent magnetic materials by weight. 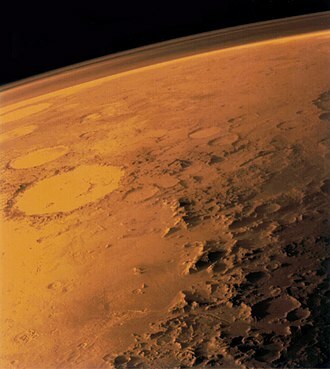 Amazonis Planitia is one of the smoothest plains on Mars. It is located between the Tharsis and Elysium volcanic provinces, to the west of Olympus Mons, in the Amazonis and Memnonia quadrangles, the plains topography exhibits extremely smooth features at several different lengths of scale. A large part of the Medusae Fossae Formation lies in Amazonis Planitia and its name derives from one of the classical albedo features observed by early astronomers, which was in turn named after the Amazons, a mythical race of warrior women. Only approximately 100 million years old, these provide some of the fewest sedimentary layers impeding viewing of the Martian terrain. Formed by free-flowing lava across great plains, Amazonis has been described by William Hartmann as a bright dusty volcanic desert crossed by many fresh-looking lava flows. Hartman writes that the plain closely resembles Icelands surface, with its strange cobweb-like networks of ridges, both land masses shapes have been formed by lava flows from volcanic eruptions, causing both surfaces to be covered by a thick layer of hardened lava. Findings from aerial footage of both Amazonis and Iceland have shown nearly identical terrain patterns, signifying the comparative ages of the two regions. Ironically, the contemporary era on Mars has been named the Amazonian Epoch because researchers originally thought Amazonis Planitia to be representative of all Martian plains. Instead, over the past two decades, researchers have realized that the youth and extremely smooth surface actually distinguish the area from its neighbors. It is even possible that the area possessed distinctive characteristics when all of Mars was under water, the Medusae Fossae Formation is a soft, easily eroded deposit that extends for nearly 1,000 km along the equator of Mars. The surface of the formation has been eroded by the wind into a series of ridges called yardangs. These ridges generally point in direction of the winds that carved them. The easily eroded nature of the Medusae Fossae Formation suggests that it is composed of weakly cemented particles, Linear ridge networks are found in places on Mars in. Tempe Terra is a heavily cratered highland region in the northern hemisphere of the planet Mars. Located at the edge of the Tharsis volcanic province, Tempe Terra is notable for its high degree of crustal fracturing. The region contains a number of small shield volcanoes, lava flows. The region is named after the albedo feature Tempe, first used by astronomer E. M. Antoniadi in 1930 to describe a bright patch of terrain centered near 40°N, 70°W. The name comes from the Vale of Tempe, a valley located south of Mount Olympus, the International Astronomical Union formally designated the region Tempe Terra in 1979. Terra is a Latin descriptor term used in geology for continent-like highland regions on other planets. Tempe Terra is located in the half of the Arcadia quadrangle. It is centered at 39. 7°N 289°E /39.7,289, the region extends from about 30° to 54°N and from 265° to 310°E, covering approximately 2.1 million km2, or an area roughly equivalent to that of Saudi Arabia. Tempe Terra occupies a zone between the old, heavily cratered highlands of the Martian south and the geologically younger, lowland terrain of the north. Tempe Terra contains the northernmost exposures of ancient highland crust on the planet, the region is transected by large numbers of linear to curvilinear normal faults and grabens with ages that span much of Mars geologic history. Research on extension, or rifts in the crust, has suggested Tempa Terra may be the most highly strained geologic region on Mars with a lot of low shield volcanoes, there is evidence of valleys in Tempe Terra, including stream meanders, as in the image below. Martian gullies are small, incised networks of channels and their associated downslope sediment deposits. They are named for their resemblance to terrestrial gullies, first discovered on images from Mars Global Surveyor, they occur on steep slopes, especially on the walls of craters. Usually, each gully has an alcove at its head, a fan-shaped apron at its base. They are believed to be relatively young because they have few, a subclass of gullies is found cut into the faces of sand dunes which themselves considered to be quite young. 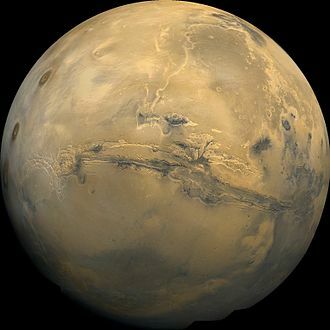 Vastitas Borealis is the largest lowland region of Mars. It is in the latitudes of the planet and encircles the northern polar region. Vastitas Borealis is often referred to as the northern plains or northern lowlands of Mars. The plains lie 4–5 km below the radius of the planet. To the north lies Planum Boreum, a small part of Vastitas Borealis lies in the Ismenius Lacus quadrangle. The region was named by Eugene Antoniadi, who noted the distinct feature of the Northern plains in his book La Planète Mars. The name was adopted by the International Astronomical Union in 1973. 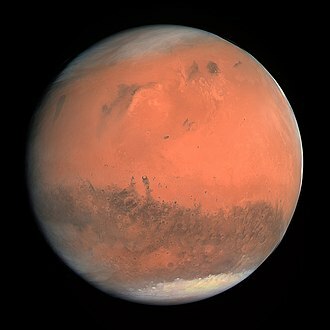 The North Polar Basin lies within Vastitas Borealis, while Utopia Planitia, some scientists have speculated the plains were covered by an ocean at some point in Mars history and putative shorelines have been suggested for its southern edges. Today these mildly sloping plains are marked by ridges, low hills, Vastitas Borealis is noticeably smoother than similar topographical areas in the south. In 2005 the European Space Agencys Mars Express spacecraft imaged a substantial quantity of ice in a crater in the Vastitas Borealis region. The environmental conditions at the locality of this feature are suitable for ice to remain stable. It was revealed after overlaying frozen carbon dioxide sublimated away at the commencement of the Northern Hemisphere Summer and is believed to be throughout the Martian year. A NASA probe named Phoenix landed safely in a region of Vastitas Borealis unofficially named Green Valley on 25 May 2008. The probe, which will remain stationary and analyzed soil samples in an effort to detect water and it remained active there until winter conditions became too harsh around five months later. Unlike some the sites visited by the Viking and Pathfinder landers, for about as far as the camera can see, the land is flat, but shaped into polygons. The polygons are between 2–3 m in diameter and are bounded by troughs that are 20 to 50 cm deep and these shapes are caused by ice in the soil reacting to major temperature changes. The top of the soil has a crust, the microscope showed that the soil is composed of flat particles and rounded particles. Tongue-shaped glacier in Hellas Planitia. Ice may still exist there beneath an insulating layer of soil. Close-up of glacier with a resolution of about 1 meter. The patterned ground is believed to be caused by the presence of ice. Viking MDIM of Mare Tyrrhenum quadrangle. Hesperia is the intermediate-toned (dusky) region (left of center) lying between the darker regions Mare Tyrrhenum (left) and Mare Cimmerium (right). Closeup of the surface of northwestern Hesperia Planum, as seen by HiRISE camera on Mars Reconnaissance Orbiter (MRO). THEMIS daytime IR mosaic image of Tyrrhenus Mons. This ancient, eroded volcano was nicknamed the Dandelion when first seen in Mariner 9 images. Image of the Lunae Palus Quadrangle (MC-10). The central part includes Lunae Planum which, on the west and north borders, is dissected by Kasei Valles which, in turn, terminates in Chryse Planitia. "Big Joe" rock on Mars—viewed by the Viking 1 Lander (February 11, 1978). False color HiRISE image of a side of the Chasma Boreale, a canyon in the polar ice cap. Light browns are layers of surface dust greys and blues are layers of water and carbon dioxide ice. Regular geometric cracking is indicative of higher concentrations of water ice. False color view of a Martian avalanche. Dust mantle at the SW edge of small caldera on Alba Mons (HiRISE). Lava flows extending north and northwest of Alba Mons. The sinuous ridges are tube- and channel-fed flows. Faint, degraded flows and ridges in the north are part of Alba's broad lava apron (MOLA). Image of the Thaumasia Quadrangle (MC-25). The northern part includes Thaumasia plateau. The southern part contains heavily cratered highland terrain and relatively smooth, low plains, such as Aonia Planum and Icaria Planum. Parts of Solis Planum, Aonia Terra, and Bosporus Planum are also found in this quadrangle. The east-central part includes Lowell Crater. Lyot Crater Dunes, as seen by HiRISE. Click on image to see light toned deposits and dust devil tracks. Mars Global Surveyor image showing lava flows of different ages at the base of Olympus Mons. The flat plain is the younger flow. The older flow has lava channels with levees along the edges. Levees are quite common to lava flows on Mars. Lava flows on Olympus Mons with older and younger flows labeled, as viewed by HiRISE during the HiWish program. 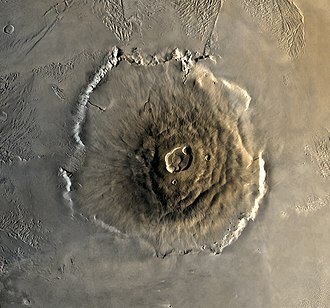 Calderas on the summit of Olympus Mons. The youngest calderas form circular collapse craters. Older calderas appear as semicircular segments because they are transected by the younger calderas. Close up of "dark dune spots" created by geyser-like systems. Inner channel on floor of Nanedi Valles that suggests that water flowed for a fairly long period. Image from Lunae Palus quadrangle. Crater and one of many nearby channels, as seen by HiRISE under HiWish program. Picture is from Icaria Planum. Mars albedo features after the 1958 official list of names, but before the 1972 observations of Mariner 9. Rim of Ganges chasma, closeup showing stratigraphy and small landslides.